Travis Ford will take Saint Louis to the NCAA Tournament for the first time as the Billikens coach. NEW YORK — Saint Louis coach Travis Ford could feel a shift about eight minutes into the second half of the Atlantic 10 Tournament championship game. The Billikens had trailed St. Bonaventure almost the whole way to that point — by as much as 15 in the first half — but Ford could sense the Bonnies were ready to be caught. The Billikens responded with a run that gave them the lead for good and Saint Louis beat St. Bonaventure 55-53 Sunday to win the Atlantic 10 and an NCAA Tournament bid. The sixth-seeded Billikens (23-12) won four games in four days to earn their first A-10 Tournament title since 2013 and get back in the NCAAs for the first time since 2014. Bonnies guard Nelson Kaputo, who played only the last minute, had a 3 from the corner for the win in the final seconds after a scramble, but it bounced off the back of the rim. 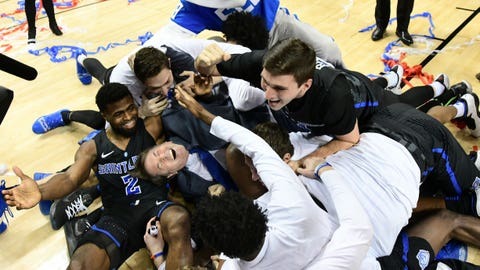 The Billikens cleared the rebound as time expired and then dog-piled on the court as confetti rained down from the ceiling of Barclays Center. Jordan Goodwin had 16 points and 14 rebounds for Saint Louis and Tramaine Isabell made a key 3, starting the decisive 12-0 run. Isabell was named the tournament’s most outstanding player. Courtney Stockard led the fourth-seeded Bonnies (18-16) with 22 points but fouled out in the final minute. 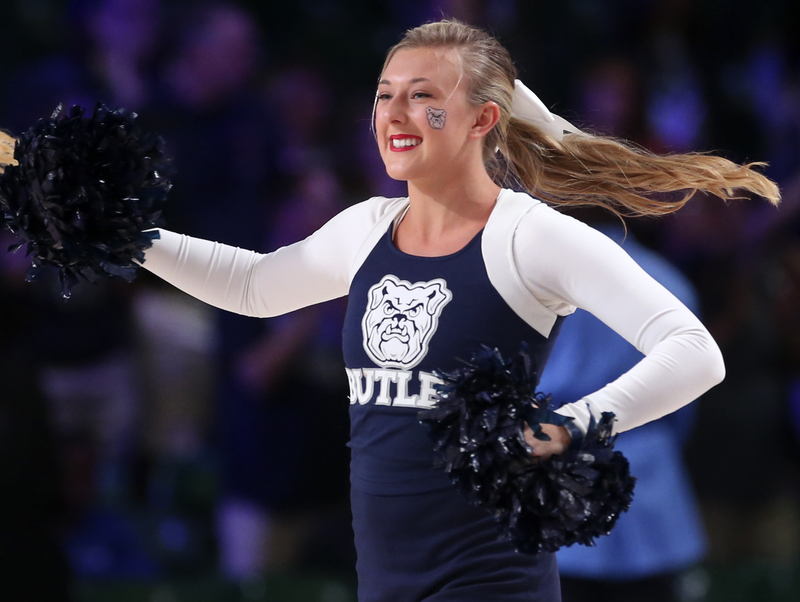 The Billikens are a team heavy on senior transfers with Isabell (Drexel), Javon Bess (Michigan State), D.J. Foreman (Rutgers) and Dion Wiley (Maryland) all playing key roles. They were picked to win the A-10, but lost four straight in late January and muddled through the conference schedule. Goodwin, a sophomore, said through the losing streak the upperclassmen kept the team optimistic. Saint Louis needed an 11-point comeback to get out of the first round Thursday against Richmond and then beat Dayton and Davidson to reach the final. St. Bonaventure controlled the first half, holding the Billikens without a field for the first 9:19. In the second half, the Bonnies went 6:09 without scoring as Saint Louis played more man-to-man defense and got aggressive with its switches. “They did a really good job of taking away some of our actions and making it a one-on-one game. And we don’t have one-on-one type players,” Schmidt said. Hasahn French made a reverse layup for the Billikens at 6:56 to give Saint Louis its first lead, 47-46, since the first basket of the game. Moments later, Wiley swished a 3 from the right corner and Saint Louis was up 52-46. “When Dion hit that 3 in the right corner, I was like, here we go,” Isabell said. The small contingent of Saint Louis fans — no A-10 campus is farther from Brooklyn — was doing its best to drown out the noise from a partisan crowd of St. Bonaventure fans from western New York. Stockard hit a 3 from the corner with 56 second left to cut Saint Louis’ lead to 55-53. The Bonnies tried to get the ball into star freshman Kyle Lofton‘s hands on the last possession, but it was poked away. The best Lofton could do after recovering was find Kaputo in the corner, and the senior missed his only shot of the game. Saint Louis: Ford, the former Kentucky guard, is making his seventh NCAA appearance as a coach. He took Oklahoma State to the tournament five times in eight seasons and also went as coach of Eastern Kentucky in 2005. St. Bonaventure: The Bonnies were trying to make consecutive NCAA Tournament appearances for the first time in program history. Saint Louis: The Billikens will find out their NCAA opponent later Sunday. St. Bonaventure: The Bonnies are hoping for an NIT bid.